Western blot analysis of extracts from HeLa, NIH/3T3, COS, and PC12 cells, using Smad2 (L16D3) Mouse mAb. 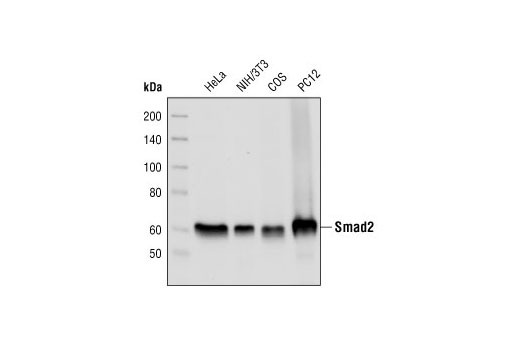 Smad2 (L16D3) Mouse mAb detects endogenous levels of total Smad2 protein and may detect Smad3 due to high sequence homology. Monoclonal antibody is produced by immunizing animals with recombinant protein specific to the amino terminus of human Smad2 protein.